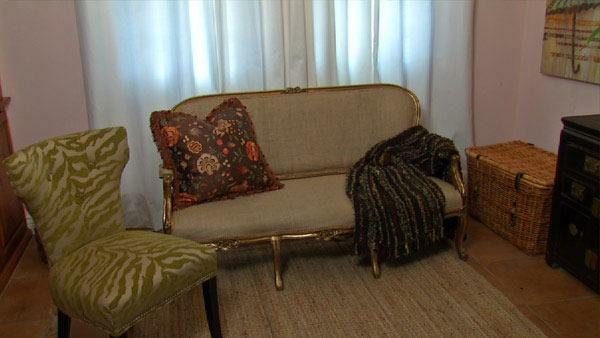 Lisa Quinn finishes reupholstering the worn out sofa. She turns it into a beautiful and classical piece of furniture. Take away all staples or upholstery tacks with pliers. Remove all fabric and batting. Put the old pieces of fabric on top of your new fabric. Cut around each template, leaving at least two or three inches overhang on all sides. Put your fabric over the back of the chair. Tuck the fabric into the sides of the chair, and pull through to the back. Holding the top of the fabric taut, staple the fabric to the back of the wood frame. Pull the bottom of the fabric up along the back of the chair and staple to the upper bar on the wood frame. Pull the sides of the fabric taut along the back of the chair. Staple to the sides of the wood frame. Drape your fabric over the seat of the chair. Pull extra fabric through the frame and underneath the seat. Pull the front of the fabric taut beneath the seat frame, and staple. Pull the sides of the fabric taut beneath the seat frame. Pleat and staple down. Put your fabric over the chair's arms. Fold one-third of the fabric forwards. Pull the fabric taut on either side of the arm, and staple to the chair frame. Locate the center of the folded part of the fabric. Cut a slit along the center of the fold, right to the end of the fold. This will allow you to wrap the end of the fabric around the arms. Attach welting on along the seams, as desired. Treasure at Storage Unit Auctions? Lisa Quinn visits a storage unit auction to find out if one man's trash can really be another's treasure. Lisa Quinn visits the winning bidder of a storage unit auction to find out if he discovered any treasures. An appraiser checks out the items and gives an estimate of how much everything is worth. Lisa Quinn turns an old worn out piece of furniture into something new and beautiful.